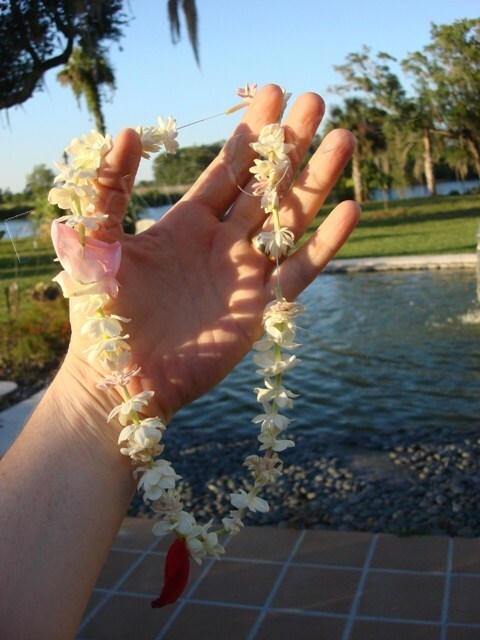 Our morning harvest of fresh picked jasmine flowers. 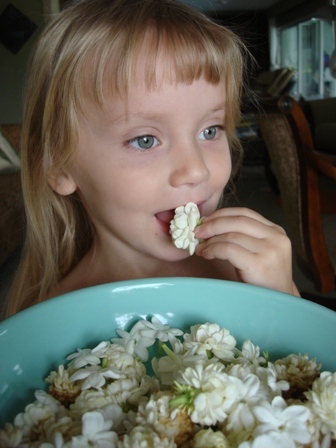 Whenever we talk about Jasmine in our yard, we are referring to Jasminum sambac…the edible jasmines. There are many gorgeous varieties. We have two of them in our garden and they are blooming profusely right now. 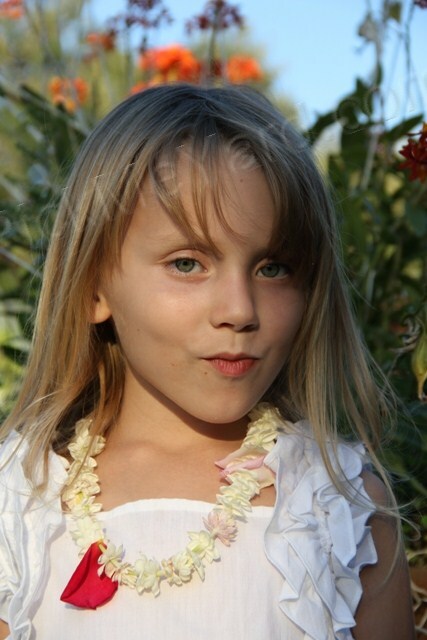 The more flowers we pick off them, the more the plant gives us. So every day we pick all the flowers and bring them in the house. 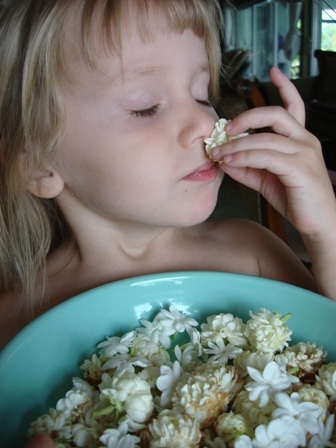 The smell of jasmine floats through our house daily like a summer dream. That's a 'Grand Duke of Tuscany' flower on the top left and two 'Maid of Orleans' flowers on the bottom. 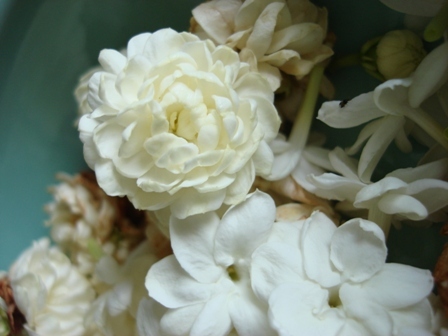 The ‘Maid of Orleans’ variety is used to make jasmine tea. 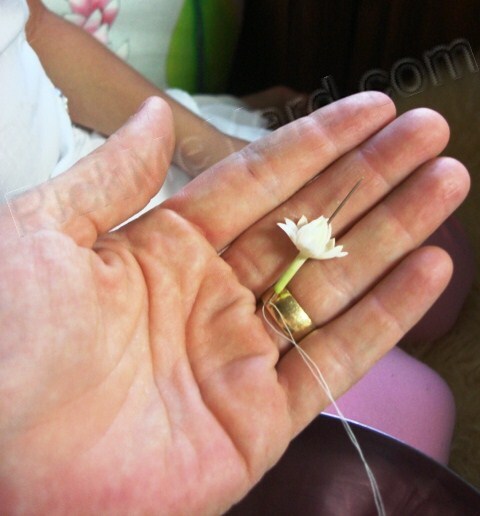 The blooms are added to the tea to give it a light scent. I’m thinking that a jasmine creme brulee would be the cat’s meow. The ‘Grand Duke of Tuscany’ looks like a small rose. 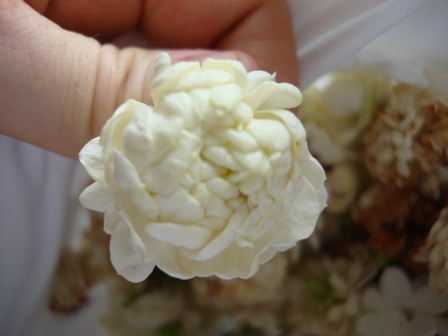 The petals don’t fall off this flower when it ages, they just turn brown. 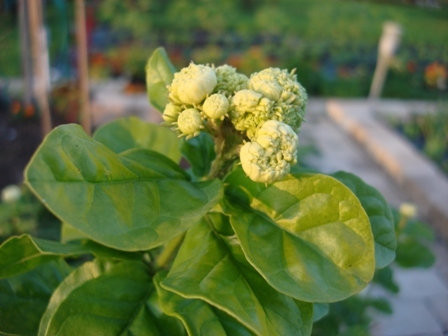 'Grand Duke of Tuscany' about to bloom. The obviously intoxicating aroma of jasmine. Smells so good you'll want to eat it...and you can! The edible jasmines are a lovely addition to our garden. I’m still hunting for the ‘Mali Chat’ and ‘Mysore Mulli’ varieties. The hunt will continue until I find them. Isn’t the hunt part of the fun? I regularly check TopTropicals to see what they have in stock. 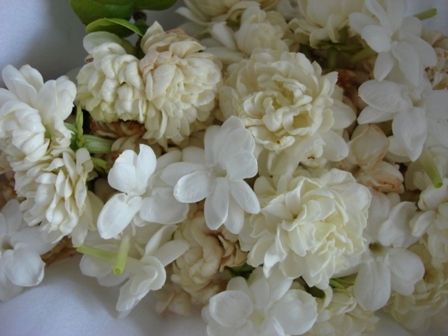 Remember that there are many varieties of jasmine that are highly poisonous.